The Hot and Hot Fish Club is a place where the food rules and the casual elegance of the atmosphere welcomes everyone to simply relax and enjoy. Without an ounce of pretension added, the stylish decor and congenial surroundings are always inviting. Family-style platters are available for parties of four, or more. Chef Chris Hastings also presents wine dinners, where patrons and vintners bring their own special wines to be paired with each course. Enjoy the bar area and feast on delicious boiled peanuts and pickled okra, or feel free to order from the full menu. Chef Chris Hastings and his wife, Idie, own Birmingham's Hot and Hot Fish Club, an intimate restaurant located in a historic building on the city's Southside. A graduate of Johnson and Wales Culinary School, Hastings worked at the Ritz Carlton in Atlanta, Birmingham's Highlands Bar and Grill and Bottega, and Lark Creek Inn in San Francisco before opening Hot and Hot in 1995. Known for its focus on seasonal ingredients, Hot and Hot has been the recipient of 11 consecutive Wine Spectator Awards of Excellence and in 1998 received the Robert Mondavi Culinary Award for Best New Restaurant. Hastings has received several regional Best Chef nominations from the James Beard Foundation and won the foundation's prestigious award for best chef in the South in May 2012. He is also frequently featured by national television programs and publications. The Hot and Hot Fish Club, housed in a historic building on Birmingham’s Southside, was one of the first farm-to-table restaurants east of the Mississippi. No doubt about it, seasonal, fresh ingredients are part of its charm. Decorated chef Chris Hastings calls the Tomato Salad his perfect dish. Once you sink your teeth into it, you know why. Local, sun-ripened tomatoes bursting with balsamic flavor, peppered with smoky field peas, drizzled with chive dressing, surrounded by a ring of fresh fried okra – this salad is perfection indeed. The locals watch the seasons for the dish, which is served only through the region’s tomato harvest. But when it is available, this signature salad is as hot as they come. Hot and Hot's bouillabaisse takes elements of the traditional dish — a seafood stew that originated in the south of France — and incorporates chef Chris Hastings' Southern cooking sensibilities. While a traditional bouillabaisse is more rustic and uses whole fish, Hot and Hot's version typically features boneless pieces of white-meat fishes like grouper, cobia, snapper and triggerfish. The stew may also contain large Alabama Gulf shrimp, Apalachicola oysters, and crab, such as stone crab claws from the Florida Keys or soft-shell crab. The seafood is cooked in a broth with saffron, fennel, basil, garlic, flat leaf parsley and a hint of orange peel. A little butter and extra-virgin olive oil give the dish richness without making it heavy. It is served with a rouille crouton — toasted bread topped with a roasted red pepper aioli. Hastings says that the development of the recipe goes back to his childhood in the Carolinas, when he spent summers in the salt marshes catching fish, digging for clams and gathering oysters. "My uncle used to make a bad version of seafood stew," he says. "I had such fond memories of great seafood but horrible memories of the stew. 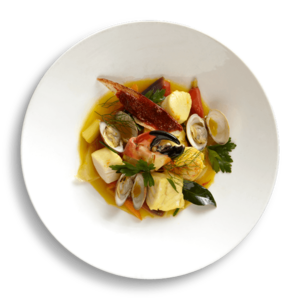 This dish was created partly around my history and partly as an homage to the bouillabaisse I experienced in the south of France."